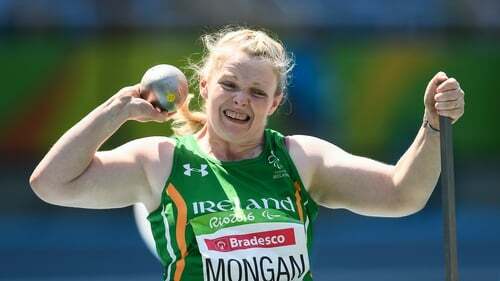 Deirdre Mongan could not hide her disappointment after finishing fifth in the F53 shot put competition at the Olympic Stadium in Rio. The Galway woman's best throw of 4.04metres was not enough to contend for a medal as Bahrain's Fatema Nedham's laid down an early marker that would not be matched. Mongan's campaign began disastrously as she fouled her first throw, but landed 4.04m with her second attempt to get on the board. That was the best the 38-year-old could do in her first set of three attempts, and it quickly became clear that Mongan would need to exceed her lifetime's best performance of 4.26m to challenge for a medal. Mongan was fifth at the halfway point of the competition, trailing leader Nedham's huge effort of 4.76m. Unfortunately, Mongan could not improve her standing on her second set of throws, with Nedham's opening salvo enough to win gold ahead of India's Deepa Malik. "That was not what I was hoping for," Mongan conceded whe speaking to RTÉ Sport. "I don't know what happened. "I've been throwing much better in training, I don't know if it was nerves or heat, or a combination of everything. It just didn't go for me. "When I got on the frame I just felt there was nothing in my arms. I can't really explain it. "I was way off the best. I'm just disappointed I didn't perform more than anything else."